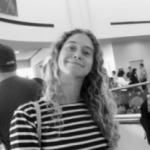 Hannah Barbakoff is a writer who recently moved to Los Angeles from NYC. She spends most of her free time complaining and stressing out. Read her blog, Semi-Normal Tendencies, or follow her on Twitter, @hannahbarbakoff.